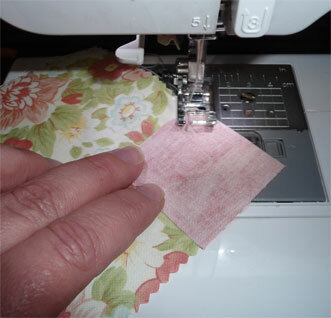 I have to admit to being a real quilting junkie. I can't bear the thought of not having my "fix" of hand-quilting in the evenings. I decided to put divert my energy into getting my small "kit" quilt put together so I can take it with me when we go to visit with Aunt Sheila. Got all 99 "snowflake" blocks made. Then I pressed them "open" so they are ready to stitch together. 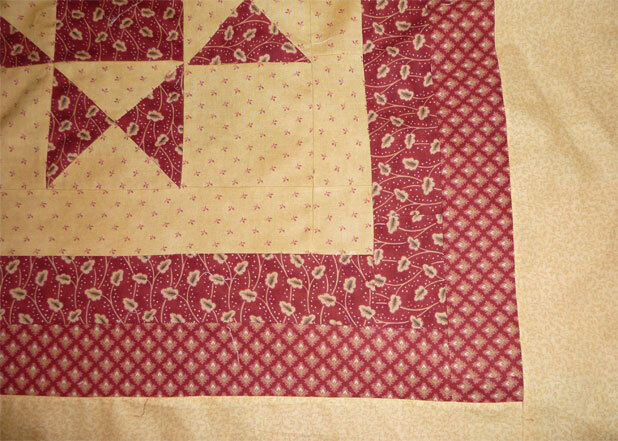 The quilt design has 50 blocks with pink corners and 49 with green corners. You are supposed to alternate pink and green. In addition, it takes a little thought when deciding which blocks to put toegether. Now you can see some of my "method". 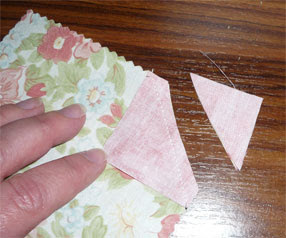 First I separated the pink-edged blocks from the green ones. Then I made separate stacks for each center color (all the yellow-centered blocks with green edges are in a stack, all the yellow-centered blocks with pink edges are in another stack and so on...). The stacks are sitting in front of my sewing machine and computer keyboard. Next I selected the 9 blocks to form the first row - and those are placed in a row on my desktop (photo above). I started on the left side and stitched the blocks together, working from left to right until the entire row was stiched (going slowly to avoid accidentally getting the blocks out of sequence). Once I had that strip done, I placed it face-up on my desktop and then selected the blocks for the next strip, matching up and down and side to side. 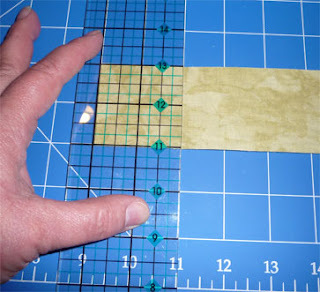 Once the next strip's blocks were selected, I stitched them together and then joined the strips. 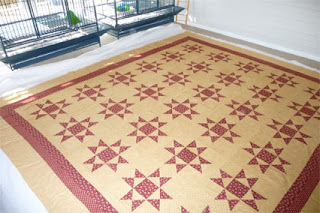 The photo below shows the quilt top after the first 2 rows have been sewn, and the 3rd row blocks just before stitching. And here it is (below) - all done except for the border fabric! I didn't precisely time the work on this - but I think I spent roughly 5 hours stitching the top. I did manage to mess up a couple of times: accidentally putting two pink-cornered blocks together instead of alternating. But for the most part I kept it straight. Now to make the "sandwich." And if I want to take this quilt with me anyplace, well, toting it around is pretty awkward. I should say it was awkward. Problem solved! 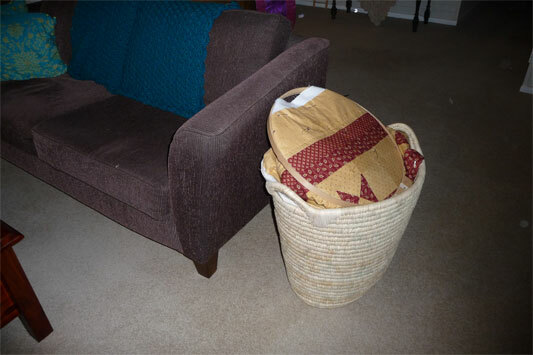 Spotlight (one of my favorite homewares and craft stores) got in a shipment of really big rafia baskets. They are sturdy and the larger sized one is perfect to stuff my quilt into (even the hoop fits in it!). No need to try and neatly fold it. I can just grab it all and plop it down in the basket. I just have to be sure and keep the parrots away from it (or they'll have it shredded in no time...). When I finished my first quilt I was so excited - but I didn't have another project in the "works" and ready to go. 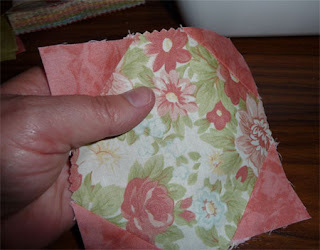 I hadn't realized how much I would miss having something in the "hand quilting" stage. I'd gotten used to sitting every evening and blissfully stitching away - and when I suddenly was without a project, well... I went through quilting withdrawal. It took quite a bit of time to decide on my second project, get the design done and the materials bought. And because it's a big project it took several days to get the quilt top pieced together and ready for quilting. I am determined to make sure from here out that I have a UFO (Un-Finished Object) in my closet from here out so that as each project is completed I'll have another ready to pounce on. 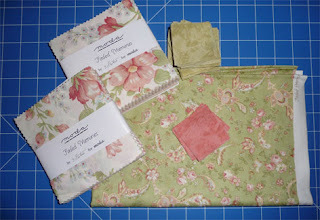 And here it is - project number 3 - a quilt "kit" I purchased from "Patchwork With Gail B." 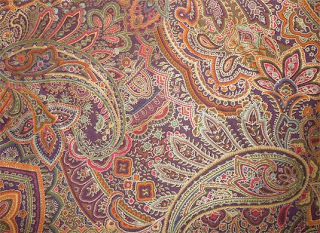 I don't have a photo of the design (and I don't own the copyright to the photo that came with the quilt, so I can't post that here), but I can give you something of an idea of what this one will be like. It's a small quilt (not a big bedspread) and is made up of 99 "snowball blocks" with a simple one-fabric border. 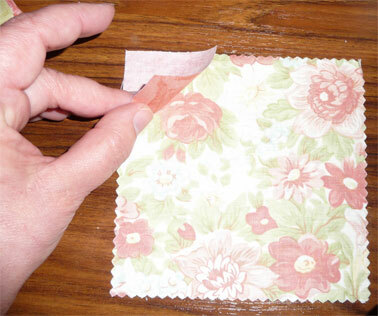 The quilt kit comes with 2 packs of 50 "pre-cut" squares (each square becomes a snowball block). The other pieces you have to cut out yourself. First you cut out about a bazillion little 2-inch squares (there are 99 snowball blocks, each one needs 4 of the 2-inch squares). This part (cutting the 2-inch squares) actually went pretty fast. I only needed about 20 minutes to get it done. 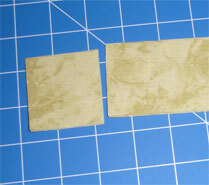 You take a 5-inch block and lay a small 2-inch block square on the corner (right sides together). Then stitch across the end from corner to corner (as shown below). Flip the corner over and press. And here's one completed "snowball" block. Friend Pauline C. took me shopping at her favorite quilting supply store y'day. Along for the fun was her friend Becky, who I liked instantly. Becky's a budding quilter like me. 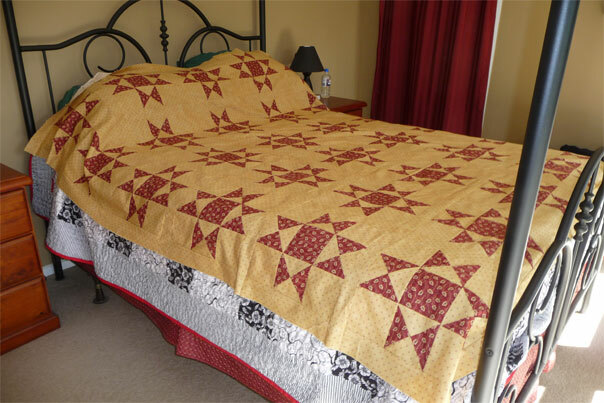 Pauline is a seasoned quilt-a-holic with a lot of projects and an amazingly keen eye for matching colours and patterns. When we got to the store, Pauline ran ahead of me and then turned around quickly to face me as I walked in. She said she wanted to catch the look on my face. I guess I didn't disappoint her because I instantly developed a case of "trout mouth." This shop has an unbelievable assortment on display. Looks like there are thousands - THOUSANDS of bolts of quilt fabrics and an immense display of "fat quarters". Yup. It's jaw-dropping. I took some Christmas fabric I wanted to match with something. Pauline and Becky helped me wade through the overwhelming selection range and found the PERFECT fabric for my Christmas quilt. After that Pauline went to the fat quarter table and began to browse. Becky found a handbag pattern that she liked and she hunted down prints for her project. 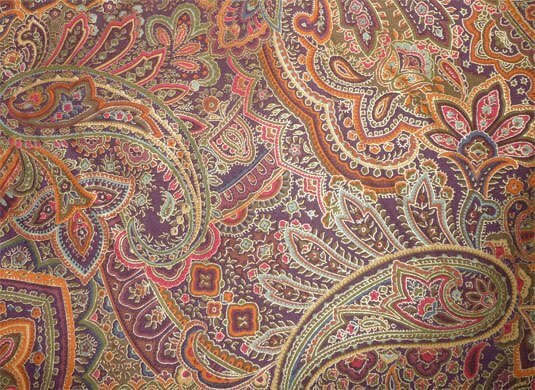 I continued to wander the rows and rows of calico - marveling at the colours and patterns. I was having a great time, but was starting to wonder if I was holding my friends up. I was feeling mesmerized by this store and realized I could spend HOURS. My friends might not be feeling the same. I needn't have worried. After about an hour or so Pauline and Becky hunted me down and asked me if I wanted to go. I answered "Oh heck, no! I'm having a ball. I don't care if we EVER leave!" They giggled at my reply but then I added "...but it's fine with me if you are ready to leave now." They said (almost in unison) "Oh... no...! Let's keep shopping!" and they promptly scattered to browse and dream over this and that. I considered it for quite a while. Kept saying "I really shouldn't... I should WAIT" but Pauline and Becky were quick to say "oh, no... don't WAIT! Get it now!" Don't you just love shopping with girlfriends who egg you on? I got that oriental print. I HAD to. Really I did. 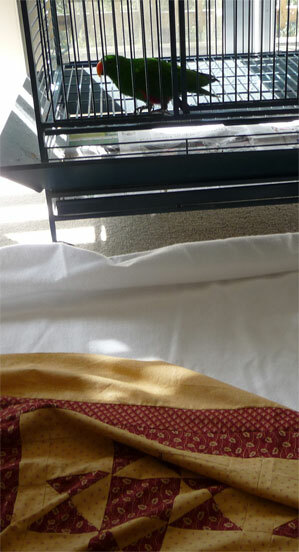 The shop owner has lovely quilt samples hanging all around - for inspiration, of course, but more than that. 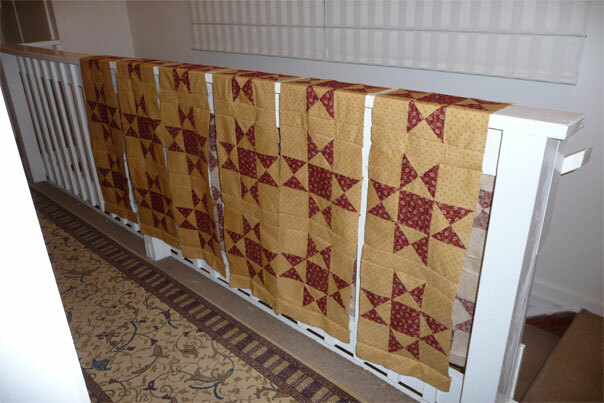 Each of these example quilts had a little sign pinned to it announcing that the quilt you were looking at could be had as a kit with the quilt pattern, instructions, and all the fabric needed to complete the top (batting and backing would have to be purchased separately). I fell instantly in love with 2 of these kits and agonized over whether or not to indulge my inclination. Naturally my shopping buddies were quick to encourage me - and Pauline pointed out that the kits were limited in quantity (and once the shop ran out there would be no more of that design). I stood there for a while reasoning with myself. At this point I had a king-sized bedspread that I'd just started quilting. I had the fabric for the Christmas quilt. I had the fabric for my shopping tote bag. That was more than enough. By now you are probably realizing I have no self-control in a fabric store (I have the same problem at plant nurseries). I selected one of those 2 kits and then found Pauline and said "GET ME OUT OF HERE!" My current project has 3 narrow bands running around the edges. 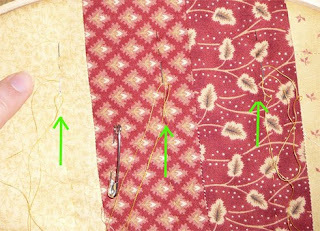 I'm not wanting anything fancy in the way of quilting here, just a row of stitches along each band (about 1/2 inch from the seams). I'm quilting using a hoop - and quickly realized as I stitch each row that it takes too much time to keep moving the hoop as I go along, esp. since I'm going to do this 3 times. So I hit on the idea of threading 3 needles and stitching all 3 rows at once - and THEN moving the hoop along. So far it's working out really well. 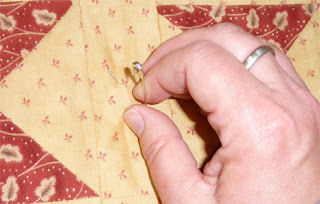 The thread (quilting cotton) is thick enough that it doesn't really tangle easily and so there's no worry about getting all knotted up as I go. I'm sure I'm not the first person to come up with this idea, but I thought I'd share it anyway. It's making this part of the quilting go by very quickly. "We made them warm so our families wouldn't freeze, and we made them beautiful so our hearts wouldn’t break." 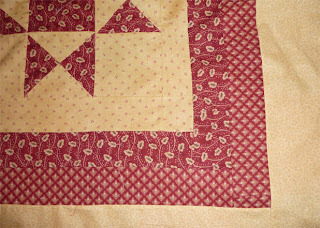 Quilt 2: Making the "Sandwich"
The top has been pieced together and the backing (shown below) is ready! My quilt is going to be quite large - nearly a king-sized bedspread. The bed I'll use it on is actually a queen bed, but it's got a very deep mattress, so I've opted to make the quilt larger so that it will hang well down the side of the bed. 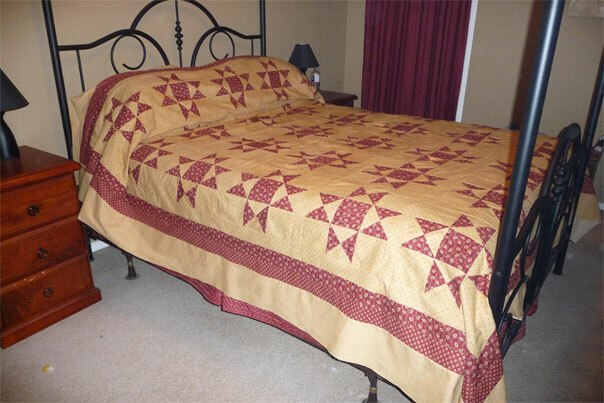 The backing is made of 2 44" panels of solid cream quilting cotton - and a smaller panel placed between them to widen the backing enough to cover the full width of the quilt top. 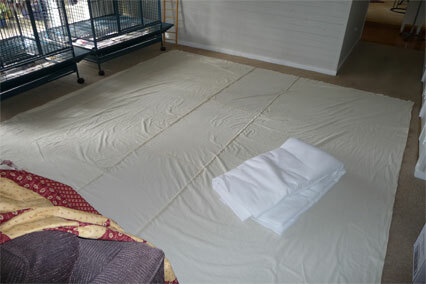 The batting (white fabric shown in a fold above) is a king-sized batting panel. Both the backing and the batting are a couple of inches bigger on each side than the top is. This is done on purpose. When the quilt is finished and ready to be bound I'll cut away the excess. But for now, having the excess hang over will help to stabilize the edge in my hoop while I'm working on it. After spreading the backing and batting, I placed the top over them and carefully smoothed it out, starting in the middle and moving outward toward the edges. When I did this I found to my horror that one of my little triangles hadn't been sewn properly - and there was a HOLE in the quilt top! I'm so glad I found it. 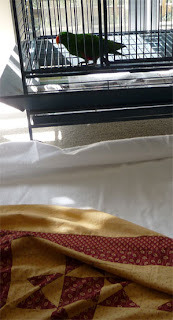 If I hadn't, that hole would have worn larger and larger each time the quilt is washed... what a nightmare. I grabbed a needle and thread and fixed that on the spot. And I spent a little more time and carefully checked each and every seam in the quilt to see if there were any other goofs (there weren't). Unfortunately the correction causes the top to bunch up a little where the repair was made. I'm just sick about it, but I'm not about to pull the whole thing apart for that one goof. The patching will hold find when it's washed. And, in all honesty, I have to say that it's unlikely that anyone but me will ever look closely enough to notice it. And here we go.. the first of 200 safety pins placed at intervals. My quilt "sandwich" is done... ready now to STITCH! Now things are moving along very quickly! I've got all 30 stars assembled. Each star will have a 2" frame around it (using the same gold fabric as found in the star blocks), seperating it from the other star blocks, then borders are to be added around the edge giving an overall "framing" effect. I reported to you last week that my star blocks are mostly "imperfect" because I accidentally stretched the "triangle blocks" when I was sewing them (not because of sewing on the bias, but because the fabric has a bit of one-way stretch that I didn't realize was there until too late). 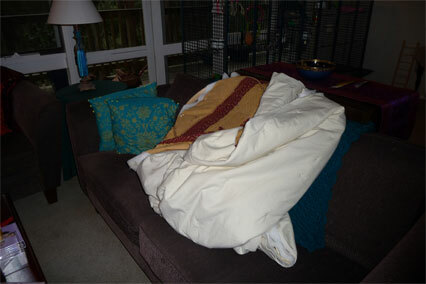 But as you can see - the quilt hasn't suffered too much. It still looks pretty terrific! And HERE IT IS! Borders are ON now... the quilt top is DONE! Isn't it gorgeous?!?!? I am so very pleased with it. As you can see it's a generous queen sized bedspread. We've got one of those fancy Latex mattresses (needed that for my back) and the mattress is very deep, so I needed the quilt to hang down further than a normal queen spread would. As you can see from the really tacky-looking support "feet", I need to make a nice long dust ruffle to extend from the bottom of the mattress to the floor. As you can probably see... the outer 2 borders are a different print. When I bought the gold and maroon for the stars, I DIDN'T buy the fabric needed for the edging. 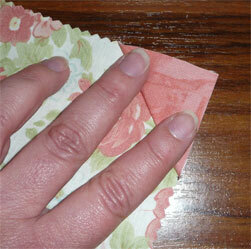 When I went back to buy the border fabric, there just wasn't enough left in stock to cover what I needed. No matter - this quilt shop in Tecoma has so many options that it only took a few minutes to find fabrics to compliment those I'd already bought. Now to buy the batting, put the backing fabric together and get with the QUILTING! I sat down and figured out how many pieces I've worked with to make the quilt top. It's astounding. 854 pieces. 630 of that were the 30 "Ohio Star" blocks (21 pieces per block). That's a lot of pieces stitched together. I'm tired. Time to lay down and have a rest.